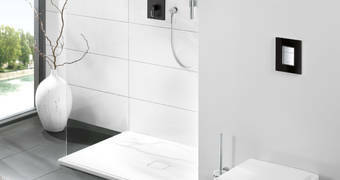 At GROHE, we pay equal attention to all areas of design in the bathroom. Our flush plates are available in a choice of luxurious finishes and eye-catching designs to add that final designer detail to your new bathroom. Wall-hung toilets and concealed cisterns are the first choice for today’s modern, designer bathrooms. In addition to our range of chrome flush plates, our collection of dual flush plates for WCs and flush plates for urinals includes a range of designs in luxurious finishes. Skate Cosmopolitan Wood plates complement the latest styles of bathroom furniture and natural stone tiles. Choose from: American Walnut, Macassar, American cherry. Natural oak, Ash olive and Bamboo. For architectural spaces choose a Skate Cosmopolitan Glass plate in Moon White, Velvet Black, daVinci satin or Titanium. Nova Cosmopolitan Print plates feature a circular print design and a circular dual flush actuation. All designs can be mounted horizontally or vertically. Reflecting the design aesthetic of our Cosmopolitan faucet and shower collections, the Nova Light flush plate offers dual-flush actuation surrounded by a soft ambient light. With Nova Light, there’s no need to turn on the main bathroom light when nature calls in the middle of the night, as the ambient glow gives off just the right amount of light. Set the LED light to any color – blue, red, green, yellow or any colour in between. Can be programmed to switch on and off at certain times. 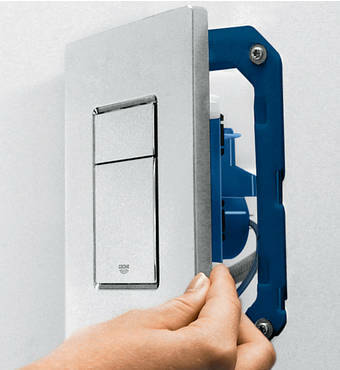 The plate can be mounted horizontally or vertically. GROHE Fresh brings a new level of convenience to the bathroom – allowing you to benefit from the contemporary look of a concealed cistern and the continuous freshness and hygiene associated with cistern blocks. 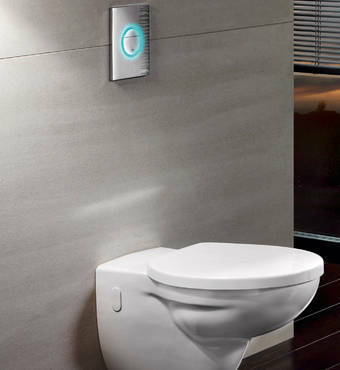 The system is compatible with all GROHE concealed cisterns and flush plates with the exception of our glass and wood plates. GROHE Fresh is available as a set – with the actuation plate of your choice, or as a retrofit accessory to use with your current GROHE flush plate.